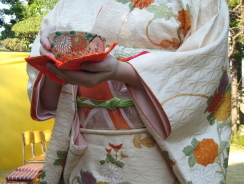 I will introduce 'Kimono',traditional Japanese clothes in this page. Until middle of 19th century, the word kimono only signified clothes. In Meiji era, after western clothes came in, we started to call Japanese clothes 'wafuku' or kimono' to distinguish it from western clothes. Now, when we say 'kimono', we sometimes mean generally clothes and sometimes mean only Japanese clothes. Now, the word 'kimono' has became international. We have another name indicating 'kimono' which is 'gofuku'. The word is related to ancient China. It is not clear how ancient Japanese wore. The picture of clothes is first appeared on the wall of Takamatsuduka Burial Mound. They were separate clothes and the hem of the upper clothes covers the lower clothes. And woven belt is around the waist. From Kamakura to Muromachi era (13-16th century), women's clothes had become one-piece. Samurai warriors wore simple ceremonial clothes called 'hitatare'. In Edo era (17-19th century) 'kamishimo' had become the formal dress for men. On 'kosode' (long kimono with short sleeve), they wore 'kataginu' (showl) and 'hakama' (divided skirt). By the influence of Kabuki and Ukiyoe of kabuki actors, gorgeous kimono became popular among common people. Obi (wide belt) developed and it was tied on the back. In Meiji era (late 19th - early 20th century), by the mass production and the development of dyeing technology, various kimono was produced. But on the other hand, western clothes became popular among nobles to appeal the modernization to the western countries. Western clothes were also used as niforms of militaly, officers and students. For women, students wore hakama skirt, but there was a movement to wear western clothes because it was easier to move. From 1940 to Second World War, national clothes (similar to military uniform) for men was set. For women, 'mompe' (soft trousers) was recommended because it was easy to move. After the World War, kimono was widely wore because they owned them but didn't have chance to wear for a long time. Also, casual wool kimono was designed. By these reason, until 1970, many people wore kimono as casual wear. Now, the custom to wear western clothes is general, and kimono is only wore at the event, for exampe, New year's visit to shrine and temple, coming-of-age ceremony, wedding, funeral, tea ceremony, festival and graduation ceremony. But the concept of kimono which doesn't tighten the body with corset influenced European fashion designers and later, Paul Poiret and Coco Chanel designed the dress without corset. You can see the following Kimono nowadays. Furisode: The most formal dress for unmarried lady. It express the youthfulness with gorgeous color and picture. The characteristics is very long sleeve. It is ofen worn at the coming-of -age ceremony, wedding party, first visit to shrine and temple, and so on. Kurotomesode: The most formal dress for married lady. The ground is black and there is a picture at the bottom. It has 5 family crests with shaped resist dyeing. It is worn at the wedding party, etc. At the funeral they wear the ones without picture. Homongi: The second formal dress either for married and unmarried ladies. The characterestics is the big picture spreading from collar to sleeve and hem. It is worn at the wedding party, tea ceremony, party in general, and so on. There is similar dress called 'tsukesage' which has smaller picture and more modest. Iromuji: Kimono dyed with color (except black) and no picture. It is worn in various occasion. If you put more than 3 family crests, it will be more formal than Homongi. Tsumugi: Casual kimono not worn at the formal occasion. Elaborate pattern is woven. Landlady of Japanese restaurant often wears it. Recently, it is worn as fashionable street clothes. Komon: Kimoto with small patterns overall. It is worn as fashionable clothes in various occasion such as party, culture lesson, etc. Yukata: Think kimono worn directly on the bare body. Colorful yukata is worn at the firework displays and Bonodori (bon dance) festivals. Simple designed yukata is worn at home as after-bath wear or pajama. You will find it at the room of Ryokan (Japanese inn) prepared as pajama. There are many other kinds such as Shiromuku (bride wears at the wedding ceremony), Junihitoe (twelve layers of kimono which nobles of Heian era wore) and so on. Obi: It has a role of decoration as well as belt. How to tie it is varied by your status (married or unmarried) and occasion. Formal obi normally is 30cm wide and 4m long. Followings are the major Obis. Maruobi: It is thye most formal Obi used for wedding ceremony which is 68cm wide. Fukuroobi: Double belt used for formal occasion. Nagoyaobi: Casual Obi. The width of tying part is half size while the decoration part is full size. Obishime: Thin belt to tie the Obi ｆrom outside. Metal or glass accessories called Obidome are often put on the Obishime for decoration. Tabi: Japanese socks separated between big toe and other toes. Geta: Wooden sandal with two bases at the bottom. Thongs are put through 3 holes. When you wear it, grip the thong with your thumb and index fingers. Zori: Similar to Geta, but the bottom is flat. When you wear it, you also have to grip the thong with your thumb and index fingers. Adding to these, there are Sensu (folding fan), Kanzashi (hairpin) and so on. Most formal Kimono: On black Habutae Nagagi (long Kimono), we wear Haori (half coat) and striped Hakama (divided skirt). We put 5 family crests on Nagagi and Haori. It is generally called 'Montsuki Hakama'. It is worn by wedding groom or at the coming-of-age ceremony, funeral, etc. Semiformal Kimono: The shape is similar to most formal kimono, but there is no strict rule for color, material and weave. Only one family crest on Haori is enough. It is worn at the wedding party, tea ceremony and so on. Street clothes: It is a combination of semiformal Kimono. By the occasion, you can wear only Nagagi or Nagagi and Haori. Casual wear: The kimono worn at home made of cotton or wool. Strong for long-term use and not expensive. Followings are the major casual wears. - Hitoe: Nagagi without lining. - Samue: It used to be the work clothes for Zen Buddhist monks. Bottom wear is like trousers. The employees of Japanese inn and Japanese bar often wear it. - Zimbei: Similar to Samue, but the bottom is shot pants. - Yukata: After-bath wear used also as pajama. - Tanzen: Coat over Yukata. You will find it in Japanese inn as well as Yukata. - Kakuobi: Narrow belt for formal wear. 10cm wide and 4m long. - Hekoobi: Soft belt which doesn't strongly tie the body. 70cm wide.